Hello once again Card fighters. Today we will be discussing the current Meta breakdown going into the upcoming national championships. Our other Writer Conner Morgan has been giving us information about the past ARG events as well as he is delving into the Bushiroad spring fest events in order to give us the statistics behind each one of these events and which decks are ruling the current format. Unfortunately these results draw a very diverse image of what our current Meta actually is. Last weekend I attended an event by the name of King Of Cardfight. There was 70 people present in this event and the top 8 was nowhere near as diverse as it has been with the ARG events and the Bushiroad events. The top eight Break down consisted of Three Royal Paladin decks, Four Shadow paladin decks and then was my lonely one of deck Messiah Link Jokers. In the top 8 we saw a strange build that has been becoming more prevalent with in the past couple of weeks that build is the MLB/Thing Saver Build. In fact this was the build that ended up winning the event. Majesty Lord Blaster’s ability is a continuous effect that is only active when he is on the vanguard circle. 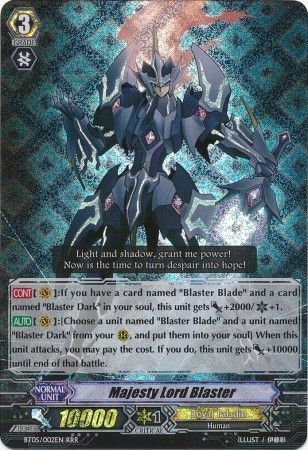 If you have a card named "Blaster Blade", and a card named "Blaster Dark" in your soul, this unit gains 2000 power and one critical. His second ability is what puts Blaster Blade and Blaster Dark into your soul. It states when it is on the vanguard circle, choose a unit named "Blaster Blade", and a unit named "Blaster Dark" from your rear guard circle, and put them into your soul, when this unit attacks, you may pay the cost. If you do, this unit gains 10000 until end of that battle. 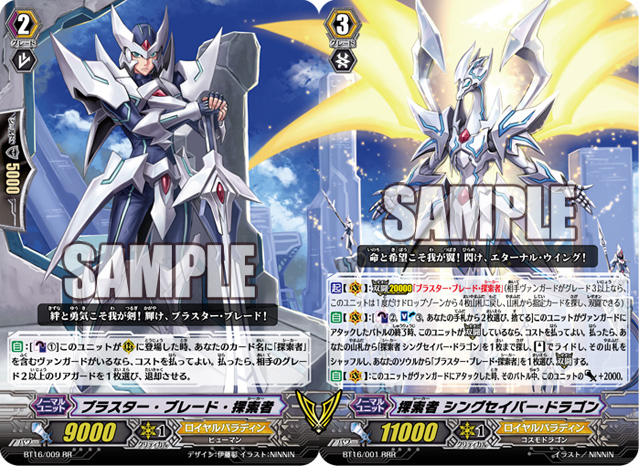 Seeker, Thing Saver Dragon, is a legion unit whose mate is Blaster Blade Seeker. Has an ability that states, Counter Blast two units in your damage zone and soul blast three cards, and choose two cards from your hand, and discard them, at the end of the battle that this unit attacked a vanguard, if this unit is LEGION, you may pay the cost. 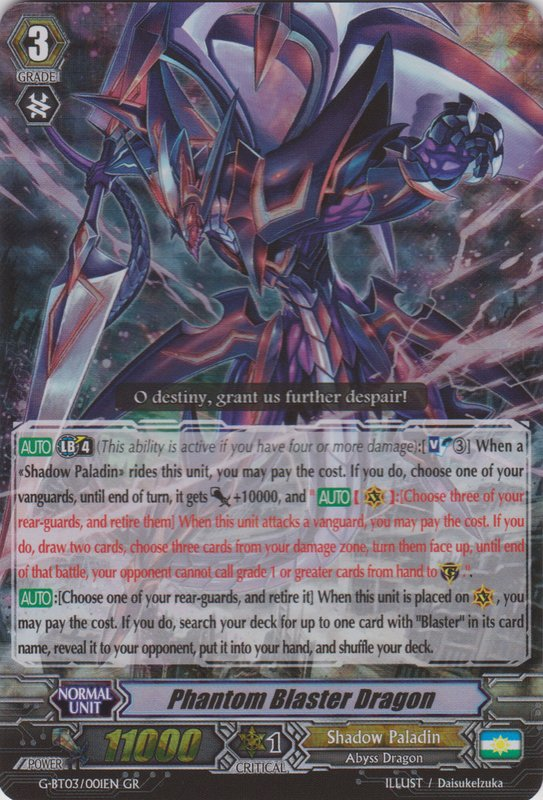 If you do, search your deck for up to one card named "Seeker, Thing Saver Dragon", ride it as Stand, shuffle your deck, choose one card named "Blaster Blade Seeker" from your soul, and execute a legion with it. It also has a secondary effect that states when unit attacks a vanguard, this unit gets +2000 power until end of that battle. Now the combo with these two units is you early game ride into MLB use his ability to feed your soul and attack with his extra critical. Since you are putting two units into your soul when you ride into your Thing Saver Dragon you will have enough soul to activate his ability. All you need now is one more card in the soul in order to use the skill two times. This build was what in the end would take first place. However this still didn’t over shadow the fact that we saw quite a few shadow paladin decks. Half of the Top 8 to be more precise happened to be Shadow Paladins. This is a trend that will more than likely not disappear anytime soon, especially since there will be even more support for the clan in upcoming sets. Starting off Phantom Blaster Dragon (Break ride)’s ability is a limit break 4 ability with a cost of Soul Blasting 3 units, When a Shadow Paladin rides this unit, you may pay the cost. If you do, choose your vanguard, and until end of turn, that unit gains 10000 power, and when this unit is on vanguard Choose three of your rear-guards, and retire them, when this unit attacks a vanguard, you may pay the cost. If you do, draw two cards, choose three cards from your damage zone, turn them face up, and until end of that battle, your opponent cannot call grade 1 or greater cards from hand to the guard circle. It has a secondary ability that has a cost of choosing one of your rear-guards, and retiring it, when this unit is placed on (VC), you may pay the cost. If you do, search your deck for up to one card with Blaster in its card name, reveal it to your opponent, put it into your hand, and shuffle your deck. 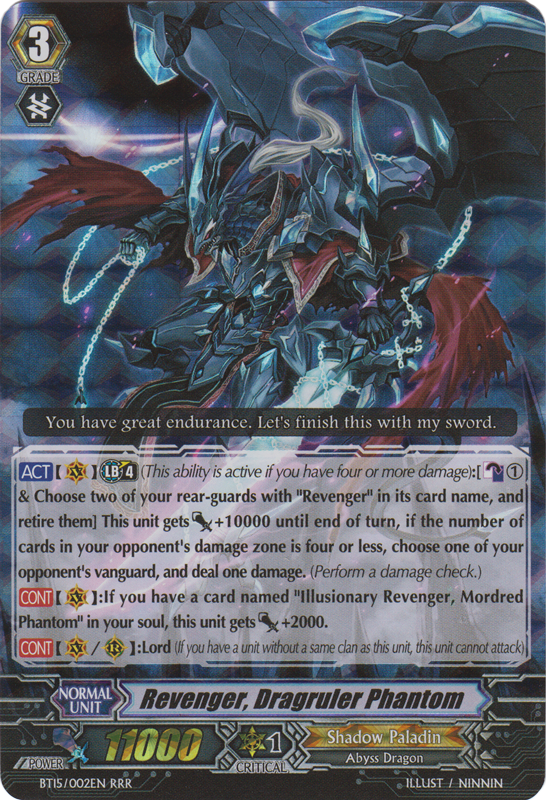 The Second Card in question is Revenger, Dragruler Phantom, his ability is a limit break 4 with a cost of counter blasting 1 card in your damage zone and choosing two of your rear-guards with Revenger in their card name, and retiring them. This gains +10000 power until end of turn, if the number of cards in your opponent's damage zone is four or less, choose one of your opponent's vanguard, and deal one damage. So they break ride over PBD with this unit and proceed to burn their opponent to 5 damage and then attack for a large number at the vanguard. But Shadow paladins and Royal paladins don’t solely rule the Top Tiers. Decks like Messiah Link Jokers and Kagero will still fight their way to the top of the bracket and give each of these decks a run for their money. This diversity is what makes vanguard such a good game. Sure there is one deck that is played by more players than the others, but any deck has the ability to win in this format. I wouldn’t be surprised if we saw at nationals something other than Shadows topping and possibly winning the event. But we still have 2 weeks before we will know for sure. That’s all I've got for y'all today so until next time I'm Scotch Janesek and keep on keepin on and always remember to clearly fan out your Damage zone so as to not cause confusion about how much damage you have currently.